If God is watching you, you'll behave. If you are interested in the latest interactions between our national leaders and space aliens; or if you want to know what bizarre mutant lifeforms have recently been found by previously unknown scientists; or which movie stars have been unfaithfully dallying with whom, you need look no further than the National Enquirer, the late Weekly World News, and other similar wasters of perfectly good trees. It's been said that the job of the editors of these publications is to separate the wheat from the chaff, and print the chaff. Apparently, however, the Enquirer at least does employ reporters who do actual reporting - that is, men and women who investigate happenings not previously known to the public, and write factual accounts, a practice to which the New York Times might do well to return. Last week, according to the Enquirer, two of their reporters (they have more than one?!) cornered Sen. John Edwards in the bathroom of a California hotel in the wee hours of the morning. The Senator was not a registered guest, but a lady with whom he has long been rumored to have had a love child was registered there. In the ensuing fracas, police charges were filed; depending on how the investigation and court case play out, the ex-trial-lawyer may find himself with some 'splaining to do. Which leads us to wonder: how is it that a person so prominent, so powerful, of such great wealth and success, could possibly expect not to be discovered in shady dealings of any kind? As everyone who has not spent the last few years on Mars is well aware, this seems to be a systemic problem. Assuming the allegations of the National Enquirer turn out to be correct, Sen. Edwards will join a long, long, long line of men of power who have been undone by behavior that anyone with the brains that God gave geese knows is hazardous to your public image. We could theorize on what drives men to make this kind of mistake; but "Why would they want to?" is not particularly interesting since everybody already knows why. The question "Why cannot they have a little more self-control, considering the risks?" is much more interesting. This leads us to perhaps the most profound change in American society over the last half-century, one which can be symbolized by a look on the back of a dollar bill. The two circular designs on either side of the back of a buck are the Great Seal of the United States - our national emblems. 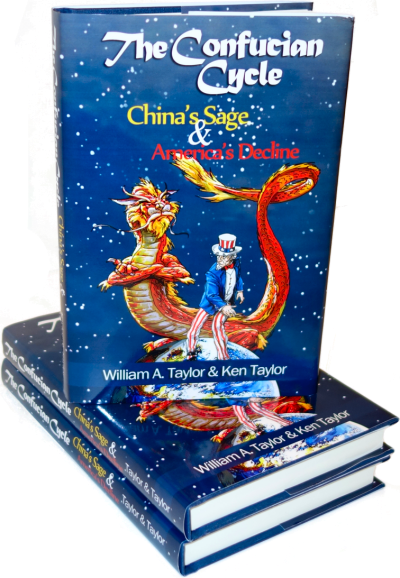 The one on the right, with the eagle, is familiar; we see variations of it all the time. But the Seal has two sides, and the pyramid is on the other side of the seal. Notice the top of the pyramid. It's not finished; instead, where the peak should be is a glowing eye. This is the All-Seeing Eye of Providence - in a word, God. The symbols indicate the heartfelt belief of our Founders, expressed also in the Latin phrase "Annuit Coeptis" over the Eye, that "He Hath Favored Our Undertakings." In other words, each and every dollar proclaims that God was watching over the United States from its inception and approved of what they did. But in colonial days, the All-Seeing Eye of Providence didn't just oversee the great doings of affairs of state. God looked over everything done by all men, in secret as well as in public, and also looked into the "thoughts and intents of the heart." 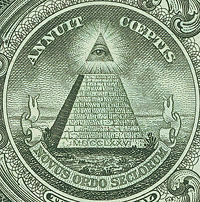 In the early days of this country, before the dollar bill displayed the Great Seal, depictions of the Eye of Providence could often be found over fireplaces and bedsteads, as a reminder that even when no man could see your doings, God could and did. Today's psychologists would view this as unhealthy paranoia and repression, but isn't repressing our baser instincts what civilization is all about? Only a fool would deny that most men have desires that should be repressed. President Clinton's famous not-really-an-apology expresses the modern view: it's only wrong if you get caught. Wriggle and twist as best you can; if you get off the hook, you're home free! There is no underlying truth, or right and wrong. After all, liberals tell us, government has no business regulating what's done in the privacy of our own bedrooms. There's nothing wrong with anything done between two consenting adults! Does it matter whether an unfaithful husband is caught or not for his behavior to be wrong? What about the actions of a terrorist? Osama bin Laden has never appeared before an American court, and never may; we've all heard that you're "innocent until proven guilty" so would the fact that he hasn't been caught and tried make him innocent? What about Bill Ayers, who was never convicted of the multiple terrorist bombings in which he participated, and who now sits comfortably ensconced in a professorial seat at the University of Illinois at Chicago? One of the great reasons for the tremendous increase in crime, immorality, dishonesty, and vice of all kinds over the last century must be the erosion of belief in an inescapable judgment. There's no doubt that human justice is a deterrent to crime; few people want to go to prison or be shot by the police while running away. Recent research indicates that each execution of a criminal saves the lives of as many as 18 innocent potential victims. Regardless of the best efforts of government surveillance, though, it is not possible for there to be a policeman - or even a camera - on every corner. Most crimes will never be solved; most criminals will never be convicted. What's to keep people from committing crimes when they aren't likely to be caught? Only their personal self-control, driven by their innermost sense of justice. When we, as a country, mostly believed in an all-seeing, all-powerful God Who would judge us for our sins, in the next life if not in this one, that was a powerful brake on wrongdoing. With this brake removed, we see the results; and it's not pretty. The effect appears in the national crime statistics. It's also visible in the national discourse. Jesse Jackson's foul remarks about Barack Obama were surely no crime, but what sort of "minister" would say such things even in private, much less in a TV studio? Even worse, later reports indicate that Jackson used the infamously racist N-word which he himself has hounded others out of public life for using. What could have possessed him? Does he not believe in the All-Seeing Eye? Either he knows there's nothing actually wrong with the N-word, in which case God will judge his hypocrisy; or he really does view the N-word as a foul curse, in which case God will judge him using it. At least, you'd expect a supposed man of the cloth to think this way. Or does he not believe in his own professed religion? The virulent attacks waged against any truly religiously devout person who aspires to high office, seen in this light, are not merely unfair but positively bad for the country. Mitt Romney ran into a buzzsaw in his recent run for the presidency, although a more morally upright individual is hard to imagine. Nobody is perfect, religious or otherwise; still, it makes sense that anyone believing in a Higher Power is going to make special effort to do what is right, regardless of whether someone is watching. Isn't that just the sort of person we want in charge? Such a person would be less gaffe-prone too; if they've not established a vast gulf between their personal life and private life, as Eliot Spitzer, John Edwards, Jesse Jackson, and so many others apparently have, they're less likely to fall into it. Maybe what we need in schoolhouses - and the Houses of Congress too - is nothing so controversial as the Ten Commandments. The reverse side of our national Great Seal would do just as well. Does Capital Punishment Have a Deterrent Effect? I'm afraid conscience doesn't really mean much these days. It's interesting that therapists spend all their time telling people to understand their emotions but not when those emotions tell them to avoid immorality. I believe the article misses the point, but by just a hair. I believe the problem is not because of a lacking belief in a final judgment, I know people that firmly believe how they are living will lead them to hell but figure they can reform before they die. Instead it is the lack of a codified moral system. It is easy for a Christian (or any other religious person) to be hypocritical, because their moral views are set not by their personal desires and feelings but by an external force. The Bible tells Christians what is right and what is wrong. Every person will find at least one rule in the Bible difficult to follow. A good Christian works their whole lives trying to improve themselves to meet the ideal of perfection but will never reach it. Without that external moral guide I believe it is impossible to have a fixed set of morals. A person can always come up with a way to explain to themselves that what they are doing is right and proper. Of course its ok that I cheat on my wife, she doesn't really understand me or isn't taking care of my needs or whatever other excuse works at the time. A persons own moral set evolves as they age. If a person doesn't have a written set of morals, such as the Word of God, then their own concept can drift where ever their desires want it to. Even if a person does believe that they are going to be judged at the end for their actions they will still follow their whims because they honestly believe that they did nothing wrong. This is true from a petty thief, to a adulterer, to a murderer, to a war criminal responsible for millions of deaths.